The North End of Halifax is a neighbourhood in Halifax, Nova Scotia occupying the northern part of Halifax Peninsula immediately north of Downtown Halifax. The neighbourhood referred to as the "North End" by Halifax residents was bounded on the east by "The Narrows" of Halifax Harbour and on the north by Bedford Basin. Its other boundaries as not as sharply defined, but the western limit of the neighbourhood is generally agreed to be Windsor street. The southern boundary was, traditionally, the northern limit of General Cornwallis's original Halifax settlement along the slope of Citadel Hill (now Cogswell Street), and continuing along the northern edge of the North Common to Quinpool Road. Gottingen Street is the commercial and entertainment heart of the North End. It is home to numerous shops, bars, clubs, and performance venues. In the early to mid-20th century, the street was the beating heart of the North End. In 1950, the four blocks of Gottingen closest to downtown boasted more than 130 enterprises, including two cinemas. The street declined in stature as the peninsula lost population during the latter half of the 20th century, and as a result of car-oriented urban renewal schemes. Many nearby residences were demolished when the northern part of Barrington Street was transformed into a highway to serve the Macdonald Bridge, and when the Cogswell Interchange was built. Additionally, several blocks of houses and apartment buildings were demolished in 1958 in an attempt to boost patronage on Gottingen by providing additional car parking. 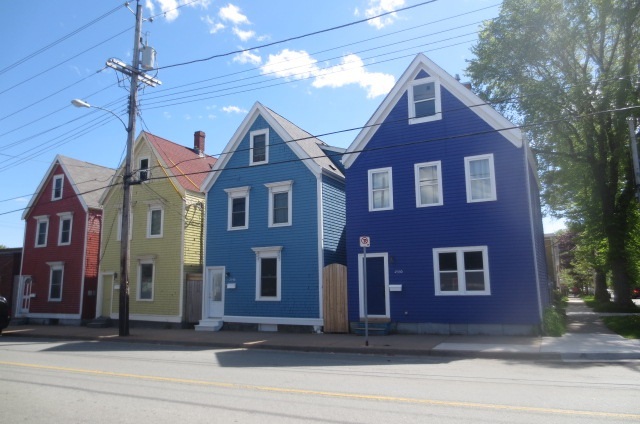 Seven new parking lots were built, displacing local residents to other areas, but this had "no positive impact on the vitality of the Gottingen Street commercial district". The Gottingen Street area population declined from high of 11,939 (1951) to a low of 4,494 (1996). However, in recent years the trend has reversed as more housing is built in the area and as vacant lots have been developed. The population has risen substantially since the 1990s, resulting in a mix of new businesses opening up. A few blocks away Agricola Street, which runs parallel to Gottingen Street, is another commercial district home to many local shops, restaurants, and galleries. It has also benefited from new residential developments that have increased the local population. The shops of The Hydrostone serve as the commercial centre of the northern half of the North End. The data relating to real estate on this web site comes in part from the Internet Data Exchange (IDX) program of the Nova Scotia Association of REALTORS® . The Detailed Information Sheet includes the name of the participating listing office. Information is deemed reliable but not guaranteed. ©2019 Listings are property of the Nova Scotia Association of REALTORS®.